The Pew Forum on Religion & Public Life recently did a survey of religious knowledge across the population. You can find the article here. 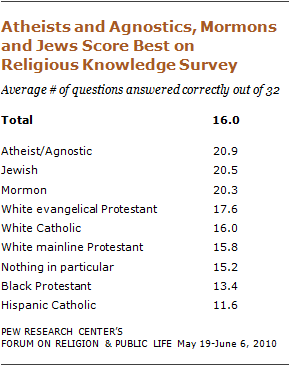 What seems to have caught folks’ attention is that atheists and agnostics scored highest in religious knowledge. I do not find this surprising. There is a lot of pressure to jump on the religion bandwagon. My unscientific observations show me there is difficulty in being a casual atheist. There is group pressure, the desire to belong, proselytizing, the natural feeling that one is missing something without religion, etc. Therefore if one is not going to go down the religion route then there is some reason to know why and have a ready defense. Ironically, my experience shows me that atheist do a better job of “always being ready to make a defense to everyone who asks you to give an account” for what they believe than most Christians. On the other hand, I do not see any requirement in the Bible that says one has to score an 80 or above in order to get into Heaven. You can take the test yourself here. I took it and scored 100% which isn’t saying much. The test is really basic. * I will say, however, that I do not consider the list of religious affiliations in the survey results to necessarily indicate anyone one who embraces the Kingdom of God or is seeking to follow Christ in all of their life.